Movie review of “Creed”: In the latest “Rocky” picture, Sylvester Stallone plays a supporting role, serving as trainer and adviser and counselor to the hero (Michael B. Jordan), Apollo Creed’s son. Rating: 3 stars out of 4. He just can’t let him go. After nearly 40 years, Sylvester Stallone just can’t quit Rocky Balboa. In the latest “Rocky” picture, “Creed,” the seventh since 1976 when the Italian Stallion first climbed into the ring, Rocky is a supporting character. He stands on the sidelines, serving as trainer and adviser and counselor to the hero, a hungry young boxer named Adonis Johnson (Michael B. Jordan), who later takes on the last name of his father, Apollo Creed. 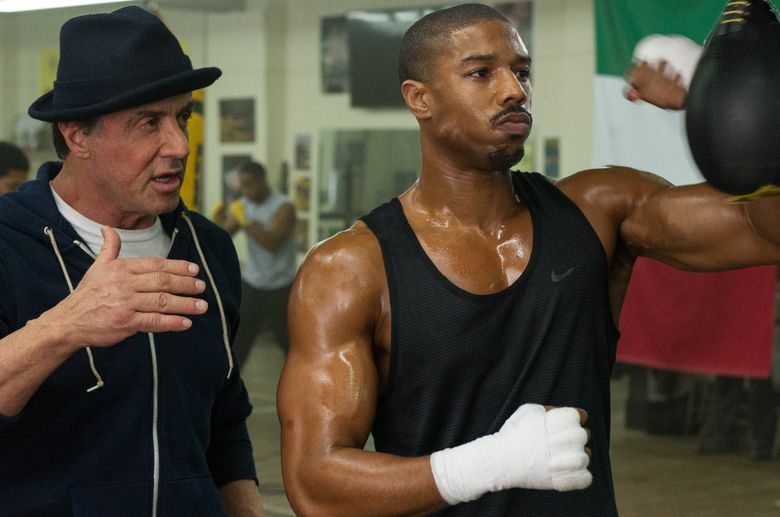 ‘Creed,’ with Michael B. Jordan, Sylvester Stallone, Tessa Thompson, Anthony Bellew. Directed by Ryan Coogler, from a screenplay by Coogler and Aaron Covington. 133 minutes. Rated PG-13 for violence, language and some sensuality. Several theaters. To get a shot at the title. To pummel and be pummeled. Jordan and director Ryan Coogler, reunited after winning great praise for their work in 2013’s “Fruitvale Station,” work effectively to make the picture their own. Jordan’s character, born after Apollo died, didn’t even know who his father was for much of his youth. His mother was a woman with whom the married Apollo had an affair. He’s embittered by having grown up fatherless in juvenile facilities. He’s a self-taught fighter who, when he learns who his dad was, travels from his home in L.A. to Philadelphia to seek out the man who fought, then befriended his father long ago. He wants to follow in his dad’s footsteps, but at first wants to do so under the name Johnson in hopes of escaping his father’s shadow. He has a chip on his shoulder, but he’s, at bottom, a good-hearted striver. Rocky relates to that quality in the kid and so agrees to train him. Off on the sidelines, Stallone works quietly. Building on the mood he established in 2006’s “Rocky Balboa,” he turns his performance into a meditation on aging and loss. His pal Paulie is dead. His beloved Adrian is dead. He’s gray and slowed by the passage of the years, and late in the movie disease is added to the equation. But he’s no caricature. Stallone loves this character, feeling a kinship to him at a deep emotional level. Bringing some of the most subtle acting of his career to his portrayal, he invests Rocky with dignity and an affecting melancholy. Bill Conti’s famous “Rocky” theme is injected, briefly and subtly, and once more our heroes ascend, slowly, the so-called Rocky steps in Philly. The movie’s tropes are comforting in their familiarity. The tale of a decent hero fighting long odds never gets old.